Jamie Ridgewell is an East Coast surf legend, known for living each day as though it were his last. Jamie lived a life desired by many but realized by few, and on March 31, 2017, Jamie passed away in Titusville, Florida at the age of 54. Jamie’s longtime friend, Sully Sullivan, was heartbroken when he received the news of Ridgewell’s untimely death. Just a few weeks earlier the two had been hanging out together in New Smyrna Beach, enjoying life and each in great spirits. Jamie was exceptionally cheerful that day because he was finally able to give Sully with an amazing gift for his 14-month-old son, Patrick. It was a custom-built Town & Country surfboard that stood at 4’8” tall and 16.25” wide. Sully packed the masterpiece into his car and as soon as he got home he mounted the board above his son’s crib. Sully had planned to snap a quick picture to share with Jamie but was hurried off to work without getting the chance. Jamie Ridgewell suffered a heart attack and passed away before Sully ever got to share a photo of that gift. As a way to deal with his own grief and honor his friend, Sully decided to organize a paddle out ceremony on April 29, 2017. Despite the significant damage caused by Hurricane Matthew, Sully chose the Flagler Beach Pier as the best location to host the event because it was a central location to many of the important people and memories in Jamie’s life. News of Jamie’s paddle out spread fast and Sully began receiving countless messages from people who wanted to take part. Many people were still in shock over Jamie’s death. They reminisced about Jamie’s love of the ocean and discussed his many endearing attributes that drew so many people to him. The paddle-out brought out former students and friends. Left to right, Jonathan Eden, Forest Lindner, Steven Mkaig, Dylan Prestwood, Patrick Conklin, Christian Wilson, Robbie McCormick, and Ryan Conklin. Photo courtesy of Colleen Conklin. Sully was reminded of the day Jamie wandered into his old surf shop, Sully’s Surf & Skate, and the two began a conversation that evolved into a partnership. Sully and Jamie began offering after school surf lessons to local groms, teaching the fundamentals of wave riding. The surf classes quickly grew into a structured program that required the students to complete their daily homework assignments and maintain a minimum GPA of 2.5. For the groms who struggled to make the grade, Sully and Jamie provided tutoring sessions. In addition to their academic standards, Sully and Jamie encouraged their surf students to adopt healthy lifestyles by implementing a rigid physical fitness program that involved weight training, calisthenics, and grueling bridge runs. Sully and Jamie’s goal for the program was to develop strong, self-reliant, and mentally focused surf rats with good character. Their efforts paid off and the students excelled in the surf program. Before long, the program grew beyond their wildest expectations, so Jamie took over as the main director and Sully went back to managing the surf shop full time. Jamie continued teaching surf lessons for several years and even coached some of his students through the world of competitive surfing. Though a number of his students went on to win many competitions, Jamie constantly reminded them that after their best waves had passed and their greatest heats were won they needed to continue to respect one another and leave the water as friends. Jamie’s profound life lessons drew people to him. 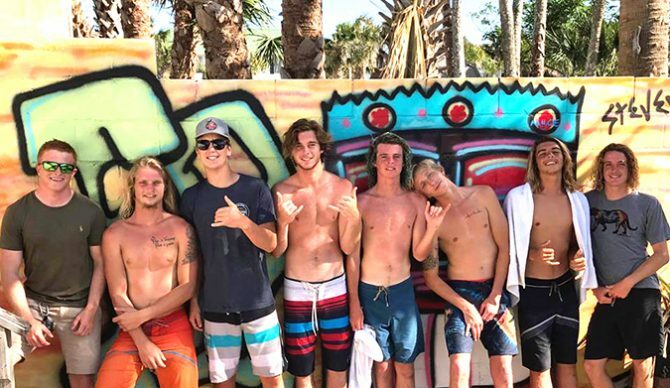 His positivity and zest for life were contagious and many groms, like his former student, Patrick Conklin, credit Jamie as being one of the greatest influences of their lives. Jamie’s giving nature did not stop with competitive coaching and the afterschool program that he and Sully developed. Jamie also set up a makeshift shaping bay in his garage for Patrick and his brother, Ryan Conklin, to custom shape their very own boards. In spite of his limited shaping experience, Jamie guided the boys through the complex process. Eventually, Ryan went on to use one of his custom shapes to compete in and win the Mehune Longboard Championship in 2015. Patrick Conklin shaping his own board under the watchful eye of Jamie Ridgewell. Photo courtesy of Colleen Conklin. It is rare that the surfing community is gifted with a bright soul like Jamie Ridgewell. It’s rarer still to find someone who is willing to share his time and talents with the world around them. Jamie’s life was short but filled with energy, creativity, and days overflowing with opportunities taken. For those who knew him, they would say that Jamie’s legacy would be to take things a bit slower, cherish every moment you can, and whenever possible, get into the water. The surf community has suffered a great loss with Jamie’s passing. Though, with death, we are often given a chance to reflect on our pasts and reevaluate our futures. If we are honest with ourselves, we would realize that we have wasted too many opportunities to live a better life. Jamie once said that “the greatest hypnotist on the planet Earth is that oblong box in the corner of the room. It’s constantly telling us what to believe.” More importantly, as we sit comfortably in front of its glowing screen, it quietly steals away precious moments of our life that we could be floating in front of a beautiful sunrise, waiting for our next set.